As a lithium explorer and lithium technology play, Lithium Australia, (ASX: LIT) already provided diversified exposure to the lithium theme, but Wednesday’s announcement that the group has partnered with soon to list MetalsTech has given it a whole new dimension, and with that, exposure to some prime assets and liquidity in emerging projects and technologies. 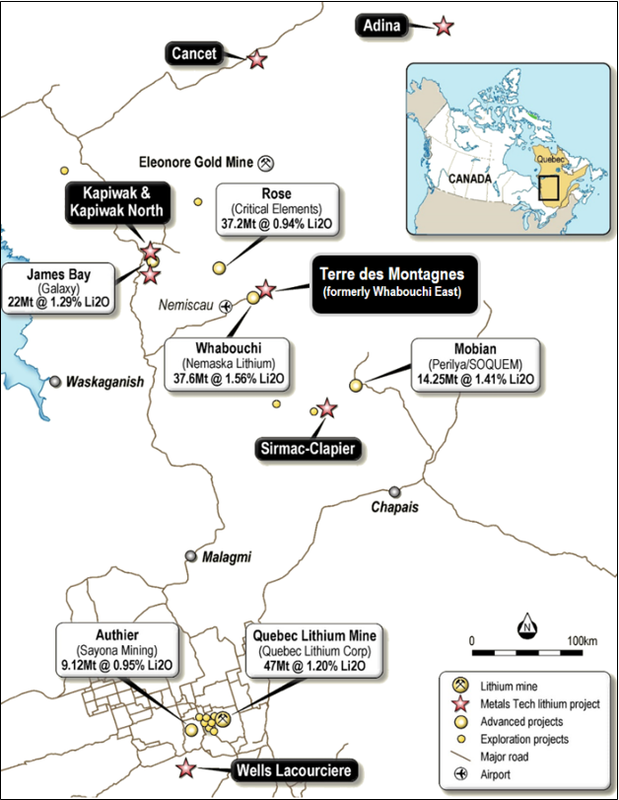 The partnership provides LIT with important equity and technology leveraged across six highly prospective hard rock lithium projects in Québec, a region well known as a ready source of lithium, as well as being a mining friendly jurisdiction. As part of the deal, LIT shareholders will be rewarded with a $1 million priority offer in the MetalsTech IPO (ASX: MTC). MTC recently acquired LiGeneration, a group in which LIT was an early seed shareholder. The new partnership agreement with MTC supersedes the previously announced relationship with LiGen. Under the Strategic Partnership Agreement, MTC will have the exclusive right to use and apply LIT’s proprietary lithium extraction technologies (including Sileach and LieNA) for the processing of spodumene concentrate from its lithium projects within Québec. As well as the aforementioned priority offer in MTC’s IPO, LIT will receive 1 million MTC shares as a result of its investment in LiGen. It will also receive 1 million shares for entering into the strategic partnership agreement. Furthermore, LIT will be issued with up to a further 5 million MTC shares and 3 million MTC options subject to meeting various performance milestones. 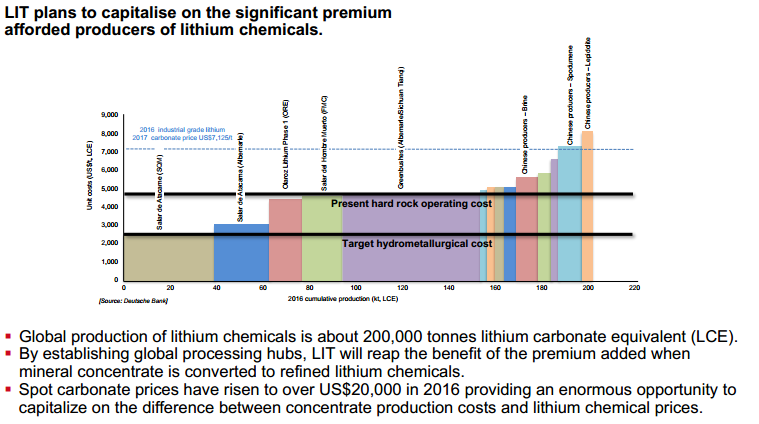 As part of the agreement, LIT will be entitled to a 2% gross revenue royalty in relation to any products (including lithium carbonate and lithium hydroxide) that are produced by MTC using LIT’s proprietary lithium extraction technologies. What this revenue figure amounts to is yet to be determined so seek professional financial advice and consider all facts before making an investment decision. These terms indicate that the financial parameters surrounding the agreement are definitely favourable for LIT shareholders. However, there is more to the story with the prospect of potential blue sky as MTC develops a portfolio of hard rock projects in Québec. These are prospective for lithium hosted in spodumene bearing pegmatites with the prominent Wells-Lacouciere project recently delivering assays of 7% lithium dioxide from surface including a 200 m2 bulk sample ranging between 2.87% and 4%. 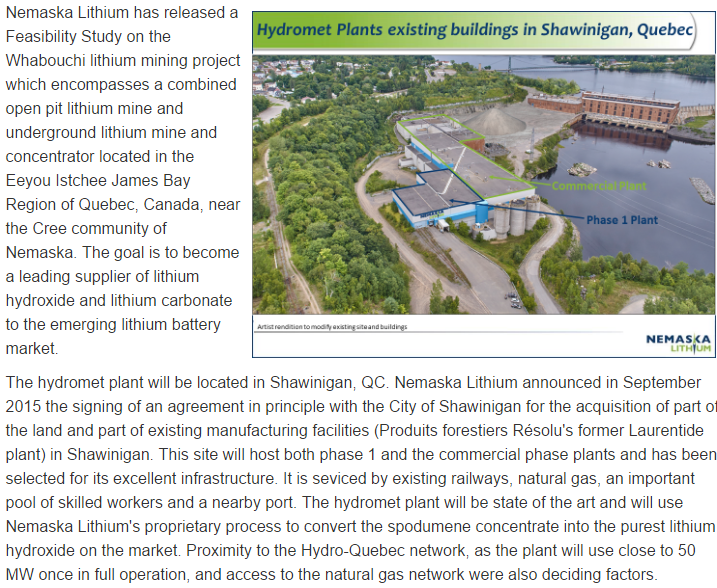 This deposit is in close proximity to the long established Québec Lithium Mine operated by Nemaska Lithium (TSX: NMX). 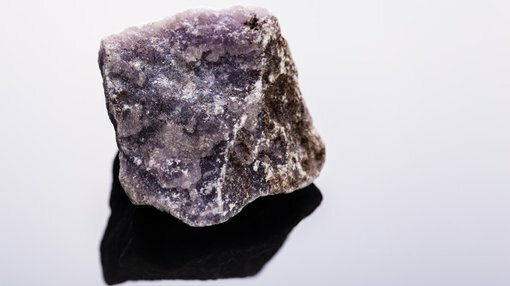 The company claims its future lithium mine (Whabouchi) will produce spodumene concentrate from one of the richest spodumene hard rock lithium deposits in the world, both in volume and grade. NMX is also looking to set itself up as a miner/tech/manufacturing play with the planned plant planned expected to transform spodumene concentrate into high purity lithium hydroxide and lithium carbonate for the growing lithium battery market. An outline of the proposed project is shown below, and it is worth noting comments regarding established transport infrastructure and access to low-cost clean energy through the Hydro-Québec network, aspects that are particularly appealing to LIT and MTC. Other assets which form part of the MTC portfolio include the Terre des Montagnes project (formerly known as Wabouchi East), which is contiguous with NMX’s 37.6 million [email protected] 1.56 lithium dioxide Wabouchi deposit. The Cancet project, which recently reported lithium dioxide surface assays grading between 1.7% and 3.8% is also part of the portfolio, as is the Adina project with surface assays grading up to 3.1% lithium dioxide. The map below details the locations of the various projects and associated infrastructure.